Natalia Luis and Cidalia Luis-Akbar are on a mission. One step at a time, sick these two remarkable women are training to accomplish something truly extraordinary; to reach the summit of Mount Kilimanjaro, sickness the highest free standing mountain in the world. As they prepare to undertake this arduous journey in November 2014, cure Natalia and Cidalia are driven by a goal as lofty as the 19,341-foot African peak they seek to reach. Using their effort as a platform to galvanize support, these sisters will raise awareness about the need for earlier, more accurate diagnostics during high-risk pregnancies and help set a new gold standard of care that gives even the most fragile newborns the best chance to survive and thrive as healthy adults. 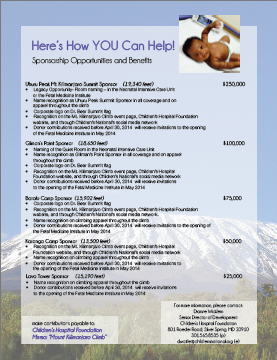 When these longtime supporters of Children’s National Health System bring the “Doctor Bear” flag to the peak of Kilimanjaro, they will be shouting, from the top of the world, their deeply held conviction that all babies deserve a healthy start. Children’s National is privileged to help these two dedicated women achieve their ambitious vision. By raising a minimum of $500,000 through the 2014 Trek, they will advance the work of our internationally recognized team of physician-scientists and researchers to radically transform newborn intensive care– harnessing technological breakthroughs to rapidly accelerate treatment and positive outcomes for the most vulnerable patients.